Dajuan Marquett Wagner was born February 4, 1983 in Camden. Born to NCAA and NBA champion Milt Wagner when he was still a teenager, Dajuan was a good young athlete who worked tirelessly to make himself great, always practicing, pushing himself, and seeking out the best competition. As a 10-year-old 5th grader, he was allowed to play with eighth graders for Morgan Village Middle School. As an eighth grader, Dajuan led the same team to a championship and brought the crowd to its feet with a slam dunk. By this time, Dajuan was known as the kid who wore special sneakers to improve his vertical leap and worked on his shooting at the local playground long after dark. Under coach Glen Jackson at Camden High in 1997–98, Dajuan scored 737 points, setting a new state mark for freshmen. As a junior, he led the Panthers to the state championship. He graduated in 2001 with 3,462 points, the most ever for a New Jersey schoolboy. He also scored 100 points in a game against Gloucester Township as a senior and was named Naismith Prep Player of the Year. 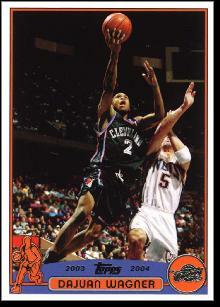 Dajuan possessed the skills to jump straight to the NBA in 2001, but opted instead to play for he University of Memphis, where his father was an assistant. In one season with the Tigers, Dajuan played 36 games and averaged 21.2 points. In 2002, Calipari revoked his scholarship to keep him from returning for his sophomore season—he believed Dajuan should go pro. The Cleveland Cavaliers selected him with the 6th pick in the NBA Draft. At Memphis, and later in Cleveland, Dajuan began feeling pain in his abdomen. He was usually able to play through it, but at times other ailments kept him out of the lineup—including dehydration and inflammation of the liver and pancreas. After three unproductive NBA seasons, the Cavs released Dajuan. It was then that the source of his discomfort was finally diagnosed. Djauan was suffering from Colitis. Dajuan underwent treatment and eventually an operation during which his colon was removed. With the help of Omar Wellington, a former high school rival, he worked his way back into shape and in 2006 signed to play with the Golden State Warriors. Although he played well in the preseason, unfortunately, he only lasted one game before his body broke down again. The Warriors released him that November. Dajuan tried another comeback with a Polish team, but suffered knee and hip injuries. He returned to Camden, disappointed but financially comfortable, and focused on raising his son, Dajuan Jr.